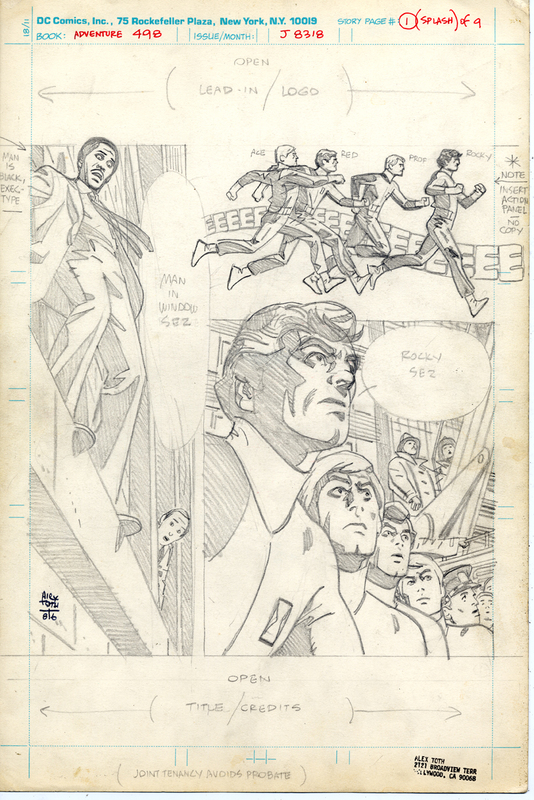 I’ll take the next several days off from posting the original pages of my artwork for “The Mark” mini-series to post and blog about these original Alex Toth pages from my collection. They are unique as far as I know; they were originally intended to appear as an episode of the “Challengers of the Unknown” ongoing series in Adventure Comics in issue #498, April 1983. Eventually they saw print in DC Comics Presents #84, in August 1985, somewhat reworked as a team-up between the Challengers and Superman. There are 7 Toth pages in that issue. The remainder of DCP #84 is penciled by Jack Kirby, and the entire issue is inked and lettered by Greg Theakston. For unknown reasons, Mr. Theakston didn’t ink directly on these pages, so they exist in their original form. I purchased these Toth originals for $200 per page at the 1992 San Diego Comic Convention. The same vendor also had all the pages from Brave and Bold #53 for the same $200 per page price. I was deeply conflicted; B&B 53 was one of my all time favorite superhero comic book stories, but I had just started on my first professional comics gig, penciling The Batman Adventures #4, and was having difficulty getting the hang of penciling; I felt I needed to see Toth’s technique for this odd, specialized task. This turned out to be a wise move: studying the master’s originals helped me click into gear, gain confidence and simplicity. TBA #5 went much more smoothly than TBA #4.